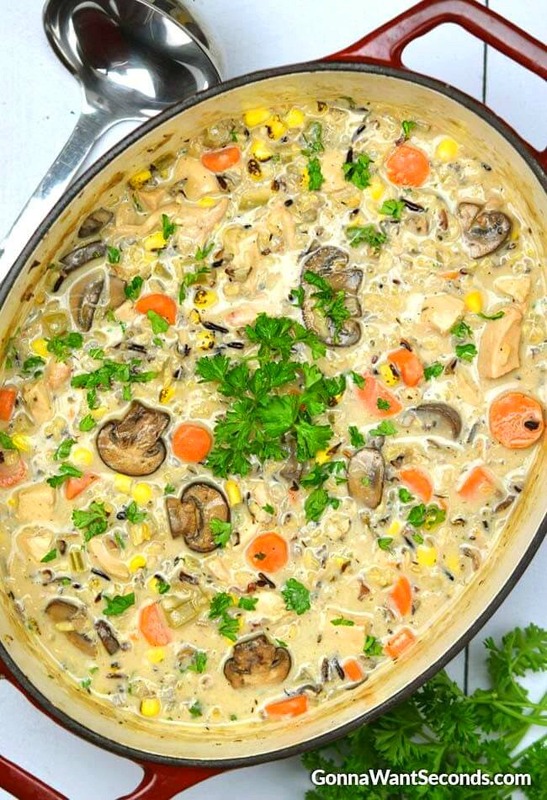 This Chicken and Wild Rice Soup is lusciously creamy and loaded with chunks of chicken, great veggies and wonderful wild rice mix! This is Comfort Food at its Best! Soup is easily one of my favorite dishes. I love it year-round. Even in the heat of summer, I often have a pot of soup cooking on my stove. And this love for soup isn’t just a passion for one specific kind—I’m a fan of all kinds. I love thick, cheesy soups. I love hearty chicken noodle soups. I love vegetable soups, meaty chili, and whatever else I can get my hands on. So when someone had me try this awesome recipe for creamy chicken and wild rice soup, I knew that I had to cook it up. I am so very glad that I did. 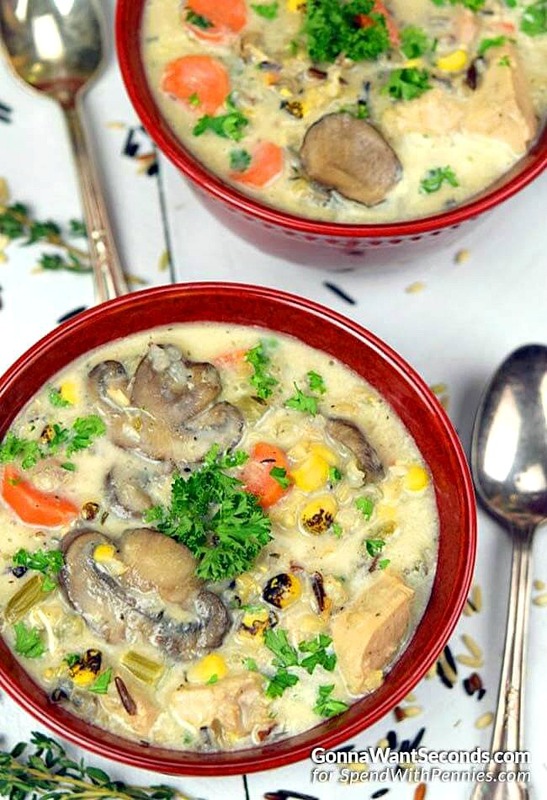 Chicken and wild rice soup have always been one of my favorite kinds, but this recipe knocks it out of the park. 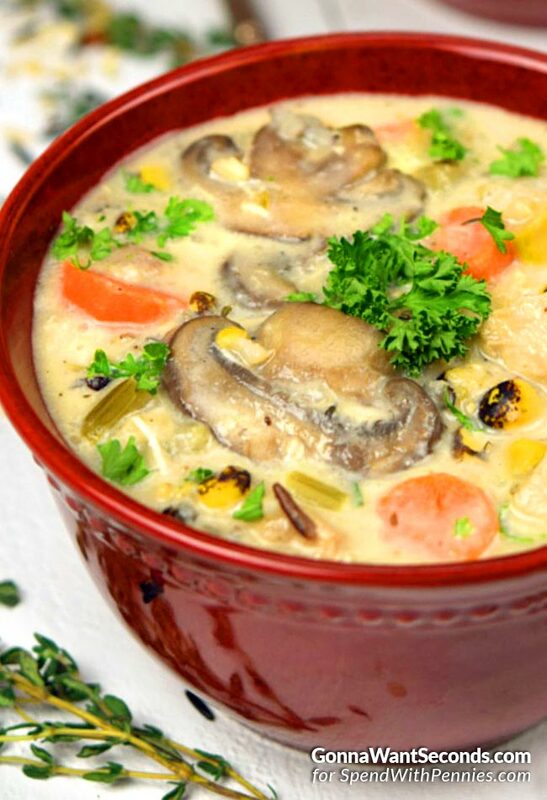 It’s undoubtedly the best recipe for chicken and wild rice soup I’ve ever had. This creamy chicken wild and rice is packed with flavor—every bite is as delicious as the last. The vegetables soak up the hearty broth, and the chicken gets a more complex flavor from the vegetables. This is comfort food like you’ve always wanted it: warm, filling, and easy to make. That is, of course, one of the best parts of this recipe. It’s incredibly easy to put together. The whole thing can be whipped up in less than an hour. That makes it perfect to slip into your weekday routine, or to make up special for guests. When you start to feel the chill of winter—or if you’re like me, and enjoy a warm bowl of soup in the summer—give this awesome recipe a try! Cream–Milk and half and half work as perfectly good substitutes for the heavy cream in this recipe. 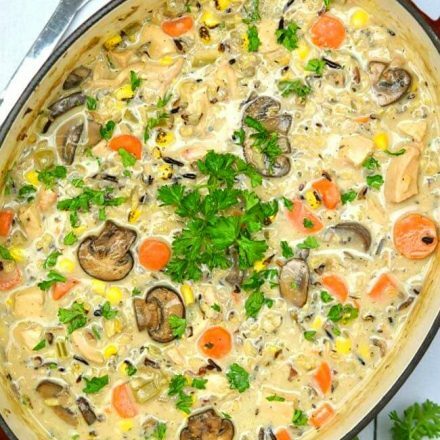 So if all you’re missing is heavy cream, you can still make this creamy chicken and wild rice soup. Thickness– If the soup gets too thick for your liking, you can thin out the recipe by using milk or chicken broth. Vegetables– As with most soup recipes, sauté the aromatic veggies before adding them to the pot. It mellows them out and brings out the sweetness in all of the veggies. Crockpot Potato Soup is a flavorful fix it & forget it meal that’s perfect for a cold winter’s day! Velvety, thick, & creamy, it’s a hearty family favorite! Chicken Noodle Soup – This chicken noodle soup is both good for the stomach and for the soul! A wholesome combo where juicy chicken meets fresh vegetables and thick egg noodles! 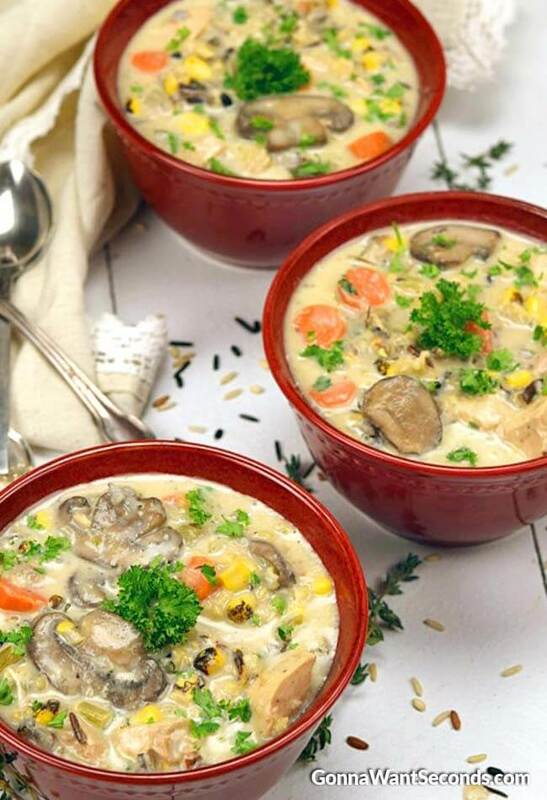 This Chicken and Wild Rice Soup is lusciously creamy and loaded with chunks of chicken, great veggies, and wonderful wild rice mix! This is Comfort Food at its Best! Heat olive oil in a large Dutch oven over medium heat. Add mushrooms and cook until they begin to brown, about 8 minutes. Transfer to a medium bowl and set aside. Add butter to the Dutch oven and cook onion, garlic, carrots, and celery until they begin to soften about 10-12 minutes. Add mushrooms back to pot. Sprinkle flour over veggies and cook 1 minute, stirring constantly. Add broth, thyme, Better than Bouillon, rice, 1 1/2 teaspoon salt and 1 teaspoon pepper and bring to a boil. Reduce heat to medium-low and gently simmer, partially covered, until the rice is just tender about 25-30 minutes. Add corn, chicken and heavy cream to the soup and simmer gently to blend flavors, 10-15 minutes. Adjust seasoning and serve.